The final quarter may be the busiest time for financial planning as clients focus on preparing for 2013. This year in particular has presented many challenges for clients as they try to grow and protect assets in the face of uncertainty around taxes and fiscal policy. Explore the feasibility of accelerating tax deductions with affluent clients. Many higher-income taxpayers may not be aware that there are no income phaseouts on claiming itemized deductions while filing tax returns for 2012. Consider urging affluent clients to talk to their tax professionals about accelerating tax deductions into 2012 if possible. Talk to small business owners about transforming losses into tax-free income. Small-business owners who will record a net operating loss (NOL) this year may be able to use it to their advantage. NOLs may be carried forward to offset ordinary income on future tax returns. These NOLs can also be used to offset the additional income from a Roth IRA conversion. For more details, click here. Conduct an annual beneficiary review. The end-of-year planning meeting can provide an opportunity to review beneficiary information for clients who own IRAs. 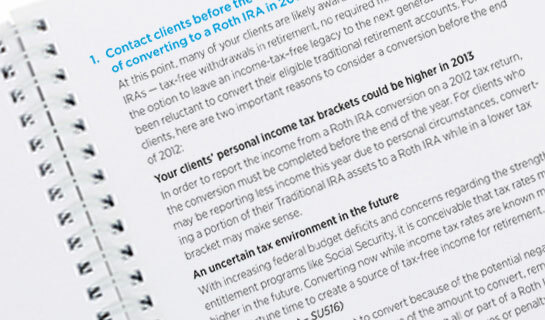 The process can help clients keep their information current and may also launch a discussion about the possibility of consolidating accounts or how to use a “stretch IRA” strategy to extend the tax-deferred income benefits to future generations. To explore this strategy, click here.